Works Project Administration and the Library of Congress, Manuscripts Division. WPA Slave Narrative Project, Virginia Narratives, Volume 17. Library of Congress. Library of Congress, Manuscripts Division. 2 type-written pages, scanned into PDF-format. 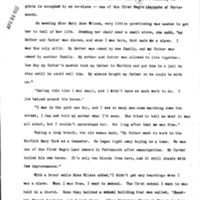 Works Project Administration and the Library of Congress, Manuscripts Division., “Interview with Miss Mary Jane Wilson,” Human Computers at NASA, accessed April 19, 2019, http://omeka.macalester.edu/humancomputerproject/items/show/28.